I used to convince myself that a good slice or hook could come in handy. For example, when confronted with a grove of trees blocking my shot toward the green, trees too high to shoot over, I could instead, because of the wrong way I was holding the club—-shoot the ball in a curving arc right around the trees. I was a switch hitter equally bad from left to right, and I could slice the ball right-handed, or hook it violently left-handed. Watching a ball curve disastrously might be entertaining, but it’s generally not recommended play. How do you cure it? Nine times out of ten a slice (curving right) shot is caused because you have a swing that is out-to-inward in trajectory. The club face meets the ball more to its side, which creates an abnormal spin. A hook in many cases is simply the opposite, a left-handed hitter with a swing that is in-to-out. Slowing down your swing if you are prone to try and over-power the ball could result in less wrist rotation which is a major culprit in slicing. As you grip the club during your swing, your lower thumb may turn too quickly inward before the club head meets the ball, causing an uneven strike (thus the fatal spin). To cure a hook or slice you need to make sure your wrists are not turning before the club strikes the ball-hopefully squarely dead-on. “If you have a slice, you’re hitting the ball out-to-in,” agreed Chris Kunkel, general manager at Silverhorn Golf Club in Oklahoma City, Oklahoma. “You’re probably coming over the top too high with your swing. A hook is just the opposite, in-to-out. The swing is coming from too far away from your body.” Kunkel said sometimes a hook or slice can be corrected by standing closer to the ball. This can result in a swing where you aren’t reaching from too far above and away, once again, putting an abnormal spin on the ball. Other tips pros recommend include keeping your lead shoulder down, or watch for what is called “flyaway shoulders,” improper upper body movement during the strike, or letting your shoulders get ahead of your hands. If you have swing problems and can find a way to have your swing filmed, you can analyze what you’re doing wrong—very helpful. 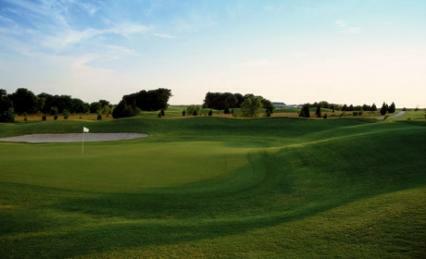 Silverhorn Golf Club is noted for its 18 holes winding through lush turf, native grasses, oaks, elms and hackberries, with four creeks on its 170 acres. “We’ve got quite a few trees here and it’s a course for all levels of play,” Kunkel noted. What will Tiger do in 2012?